Every time Stampin' Up! releases a new catalog, there are lots of items I want to add to my collection. One of those items is the new Spiral Flower Die for the Big Shot. 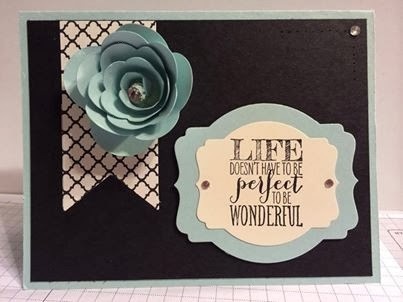 Check out this card I did up for my Demonstrator swap this weekend! I absolutely love how easy it is to create these flowers and you can totally change the look based on how tightly you coil it. The stamp set is the new Perfect Pennants which is quickly becoming another of my favourites. To order any of the items seen here, or to learn more about the Demonstrator swap and how to join my team, send me an email, give me a call at 289-280-0304 or check out my online store.